Handwork is a fundamental part of the Waldorf curriculum from kindergarten through the grades and high school. It’s so good for children to learn how to make beautiful and useful things with their hands. So how do we teach handwork at home? I have a broad definition of handwork in the kindergarten and early years. “Handwork” is all the work that the child does with the hands. A healthy kindergarten day is full of moving, doing, and playing, so there are many opportunities to work with the hands all day long. Developing strength and coordination in the hands and fingers is a key developmental task for the 0-7 year-old crowd. Hand development is linked to neurodevelopment. It also lays the foundation for writing, drawing, and artistic work in the grades. But perhaps the most critical reason to do work with the hands is that “handwork” is central to our heritage as human beings, whether it’s using our hands to create tools and necessities, to prepare food, or to make our homes and lives more beautiful. Remember that kindergarteners learn through imitation. It’s wonderful for them to see you engaging in a craft or handwork. The kindergarten day should have plenty of time and space for creative play. Your own handwork projects are great for holding the space while your child plays. You can make toys for your child, or help your child make things as props for his imaginative games. You can also make kindergarten crafts part of your weekly rhythm. It’s good to begin your handwork time with fingerplays to warm up the hands, and perhaps a song, story, or verse to help bring the focus in. 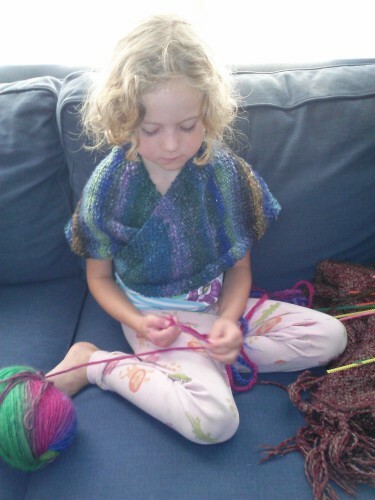 Begin by sitting down to do the craft yourself and invite your child to join you. Please let handwork in kindergarten be an invitation rather than a requirement. Your child learns so much just by watching you be creative! Many young children are too busy with play and moving their whole bodies to be interested in handwork time. I wouldn’t worry about this at all! You can still provide this child with plenty of opportunities to develop their hands including lots of sandbox play, climbing, sensory-rich crafting like wet felting and working with big lumps of clay, cooking together and kneading bread, learning to use a hammer and hand drill, fingerplays, and “painting” on a hot sidewalk with a large brush dipped in water. It might be that for your child, fingerknitting or shaping a ball of modeling beeswax is something that happens on car rides, during rest time, or to help him sit quietly for a story. Repetition is a very good thing in the early years, so don’t be afraid to do the same crafts many times and to make certain crafts part of your seasonal rhythm from year to year. For more on doing wonderful work with the hands in the early years, see this back post. Earthways: Simple Environmental Activities for Young Children by Carol Petrash. This is one of my favorites, with ideas for nature crafts through the seasons. The Children’s Year: Seasonal Crafts and Clothes by Stephanie Cooper et al. This one’s for mama, full of traditional nature crafts, knitting, and sewing for you to make for your child. Toymaking with Children by Freya Jaffke. This is a Waldorf classic, and shows you how to make toys for your child (the “with” in the title might be confusing; this isn’t actually a guide for children’s crafts). The Lavender’s Blue Kindergarten curriculum includes a craft project for every week, with step-by-step instructions, and a full color picture, all integrated into a nature-based curriculum.